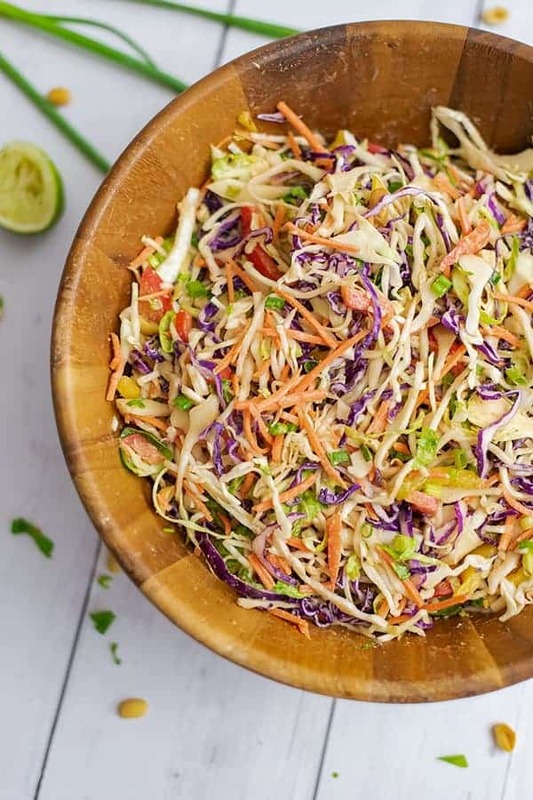 This Asian cabbage slaw with peanut lime dressing is the perfect summer side dish! 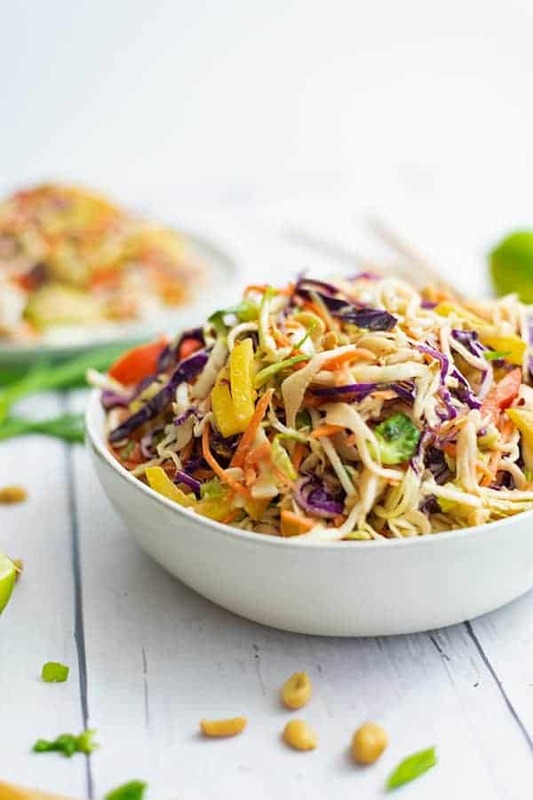 No cooking required, this Asian cabbage salad is great for make ahead meals or even to take to a summer cookout! 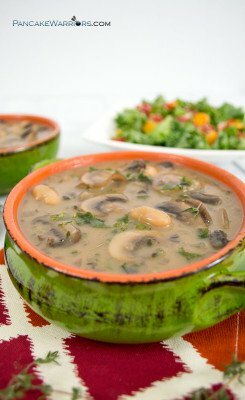 Vegan, gluten free, and super simple to make! Sometimes salads can get old and boring. That is why I love to make slaw! 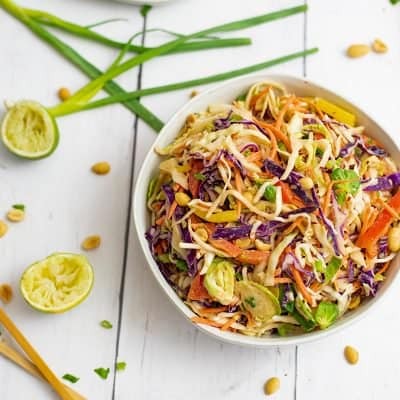 It’s got everything you love about salad (lots of veggies, fiber and water) but just different enough that it feels like you are eating something new and exciting! We are currently entering the part of summer where I will do whatever I can to avoid turning on the oven. This has meant lots of zoodles, salads, slaws and using the instant pot or crockpot for Sunday afternoon meal prep! 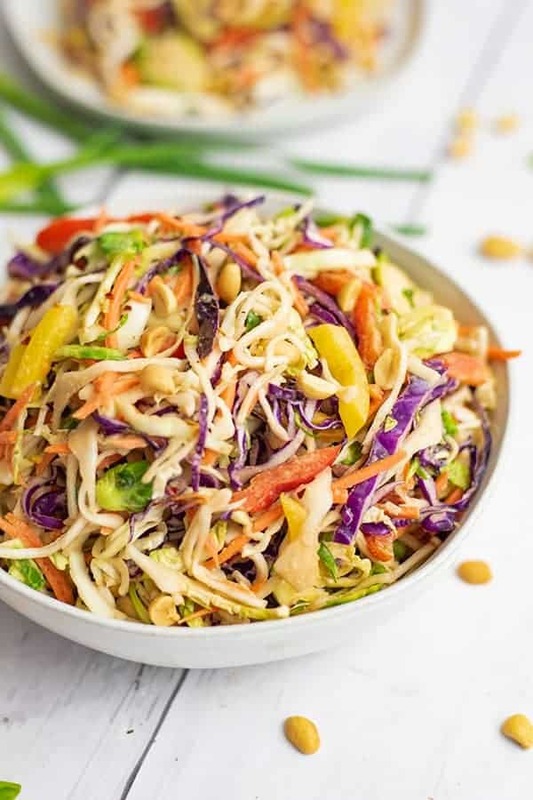 The peanut lime dressing on this Asian Cabbage Slaw is one of my favorite sauces to make during meal prep, as it goes great on zoodles, slaw, and even over slow cooker shredded chicken or grilled shrimp for a quick and easy meal! 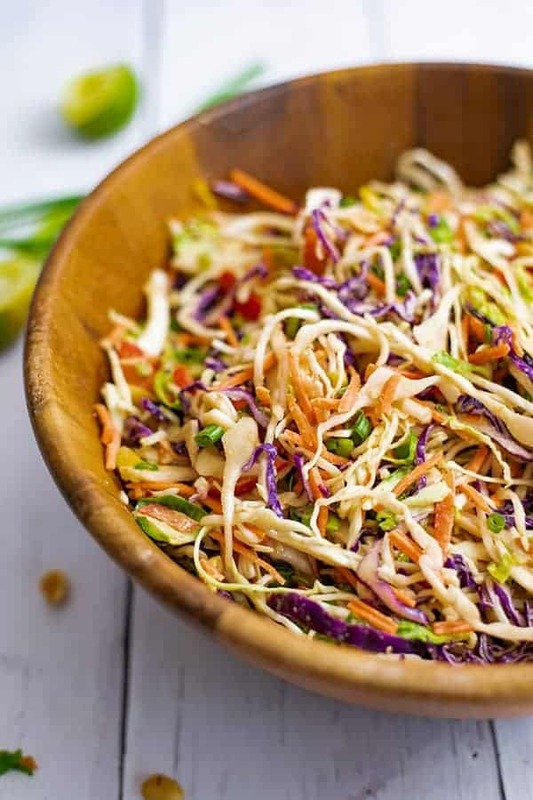 The star of this Asian Cabbage Slaw is the mixture of purple and green cabbage. I also included chopped brussels sprouts, shredded carrots, chopped bell peppers and green onions. 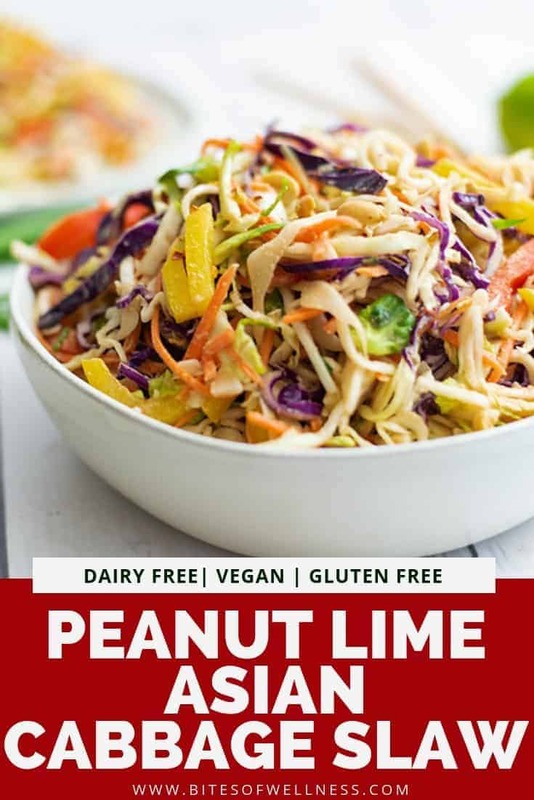 I chose these veggies because they are all able to hold up to the bold flavors of this peanut lime dressing. Another benefit of using these veggies, they will not get too soggy if you make this ahead of time! 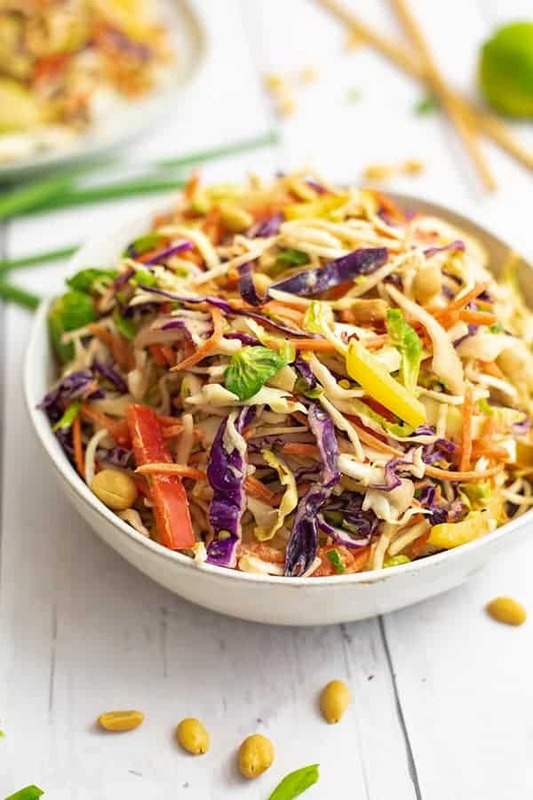 This is especially important if you plan on making this Asian cabbage slaw for meal prep! I almost always have a head of green or purple cabbage in the fridge. 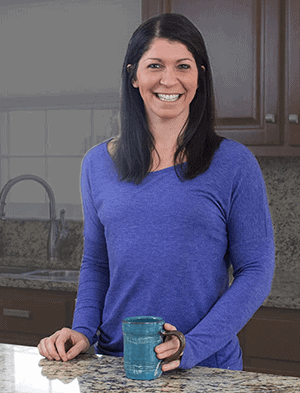 After years of being on artificial hormones (via birth control), I am doing everything I can to help remove excess estrogen from my system on a daily basis. And guess what, eating cabbage and other cruciferous vegetables (like brussels sprouts, kale, broccoli and cauliflower) are a great way to do that! These vegetables contain sulfur compounds (which is why these veggies are a little stinky when you cook them) and indole-3-carbinol, both of which bind with excess estrogen and help remove it from the body. Cabbage is also packed full of water and fiber and takes up a ton of space in your stomach when you eat it. 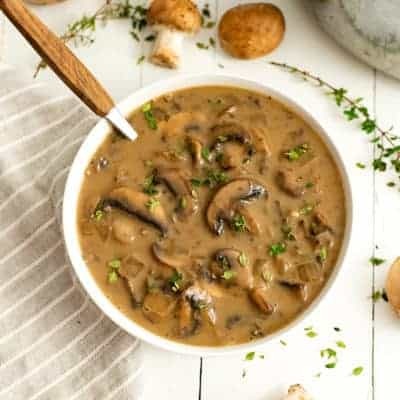 This makes it easier to feel full on less food (and likely will lower your calorie intake naturally, especially when you fill up on your vegetables first), making it one of my favorite ways to easily reduce calories without counting or feeling deprived! I have to be honest, I used to avoid making slaw recipes because I didn’t want to invest the time into cutting up a head of cabbage. It can be so time consuming! Luckily I discovered that you can use your spiralizer (affiliate) to shred up a head of cabbage in about 1 minute! This is seriously been a game changer for me, and I highly encourage you to get a spiralizer just for this (and to make recipes like this creamy garlic butternut squash noodles, and my favorite, low carb pasta). At the stalk of the cabbage, make sure you have a flat base (it’s usually flat, so just be sure). If you need to, cut the stalk so that you have a flat surface. Make sure your spiralizer is set to blade A so that there is not any blades sticking out. Press the crown of the cabbage (where all the leaves come together at the top) into the base of the spiraizer, so it will be the first to get cut. Bring the handle up to the stalk of the cabbage and press it in tightly, making sure it’s secure. Spiralize the cabbage, taking breaks to move the shaved cabbage out of the way when necessary. Note that you may have an outside leaf or two fly off, that’s ok, just keep going. When you get close to the base of the cabbage, you will likely want to stop, as the stalk can be a bit rough to chew through. 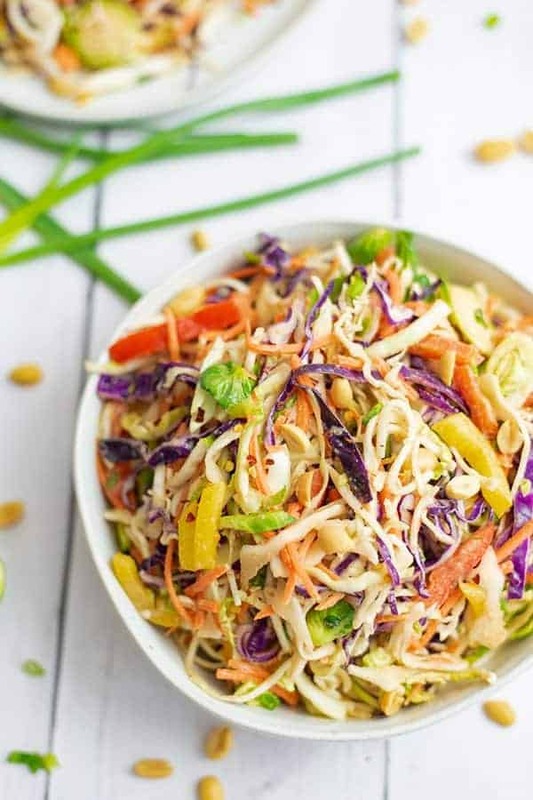 This Asian Cabbage Slaw with peanut lime dressing is the perfect side dish! Low fat, gluten free, vegan and so simple to make. Perfect for an easy weeknight meal or cookout and great for meal prep! Chop or shred the green and purple cabbage (see post for instructions on how to use spiralizer). Add to a large bowl. Chop red and yellow bell pepper into thin bite-size pieces. Add to the bowl with cabbage. Shred brussels sprouts and carrots in food processor or with a sharp knife. Add to the bowl with cabbage and bell peppers. Chop green onion, using only the green end of the green onion. Add to the bowl with the other vegetables. 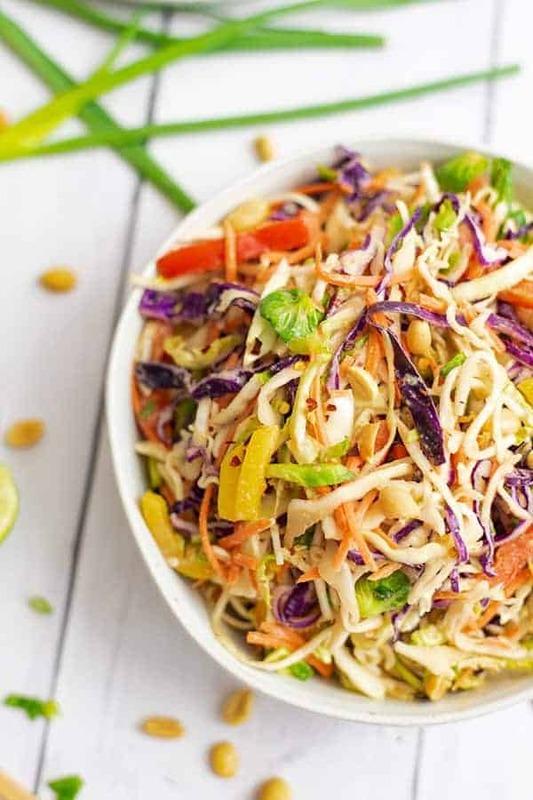 I am just loving this slaw recipe!